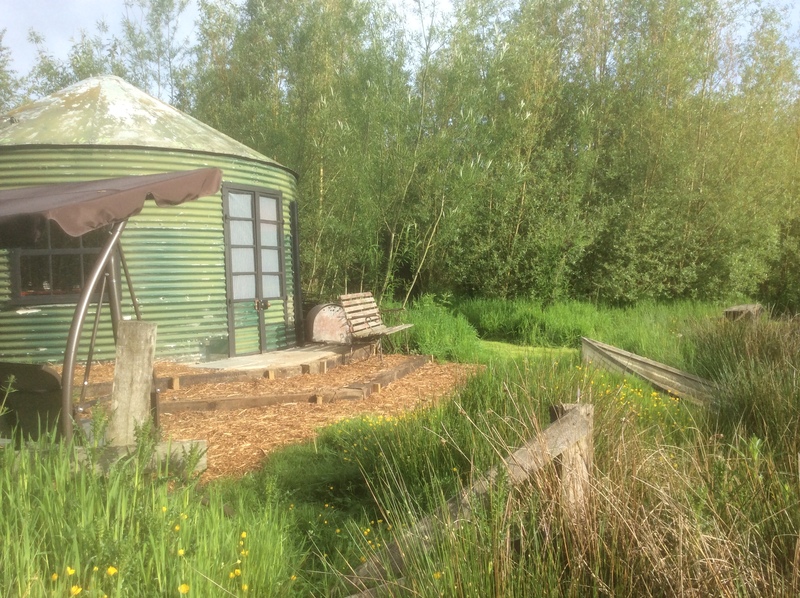 The silo is situated in a secluded position by a wildlife pond. It is furnished inside with a double bed, a large leather settee, bedside tables and quirky lighting. There is your own matching kitchen diner with everythiing you will need to prepare and cook meals. Plus your own BBQ firepit swingseating and picnic bench. The kitchen can be heated by the chimenea on chilly evenings. 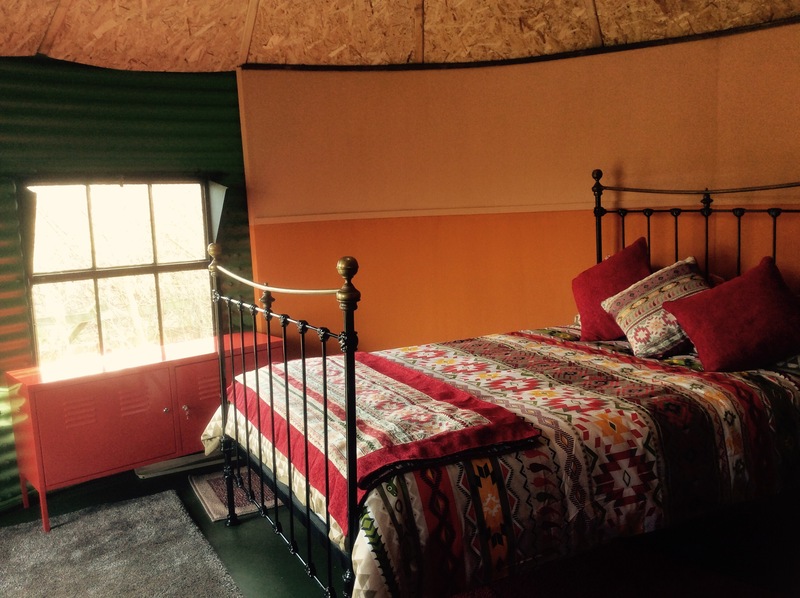 This popular glamping cabin is available from £55 per night for a couple , rising to £60 for seasonal prices. 2 nights minimum. We started building the glamping Silo way back in October 2016, we bought it after buying it at an auction from a nearby farm. It’s getting quite exciting now as we have the finishing touches to do before we open in June 2017. Phil calls them the fiddly bits!! Dismantling it was amazing, with the help from a friends JCB to lift off the roof. Then thee were hundreds of bolts to undo, with Me on the nut side and Phil on the bolt side. You may think that was tough going, but we had them all to do again when we started to put it back together back on home ground. There were some precarious moments when undoing the roof with flapping sheets of metal waving about as we took it apart! Phil had a small winch crane which we used to put up the the first couple of rounds of sheets, but we soon found that neither the height of the crane or our determined efforts were not going to enable us to make this a double story structure. Our first thoughts were to make two rooms joined with a door or tunnel, but the end result is a unique separate kitchen diner. It is quite quaint and works out ‘just the job’! The interior of the silo is like a funished circular spacious hotel room with a double bed, cupboards and a large leather settee that you can curl up in. Lining the ceiling was a work of art, Phil became a mistro, in fact genius springs to mind!! And he was determined to have a circle cut out for the skylight window too! There was a lot of painting to do after lining the walls and reclaimed windows and doors for extra light. 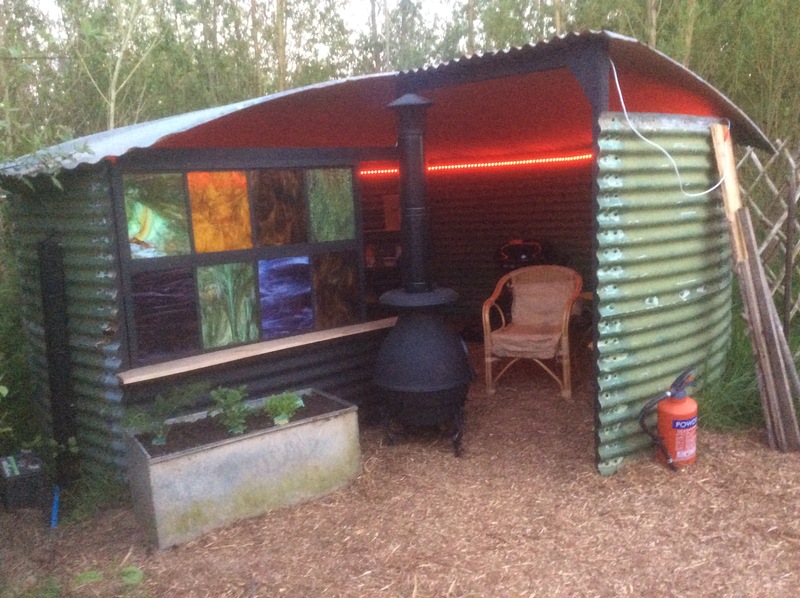 The silo also has its own solar panel so Phil can add his quirky mood lighting…. after visiting a place which sells replica vintage car lights!! 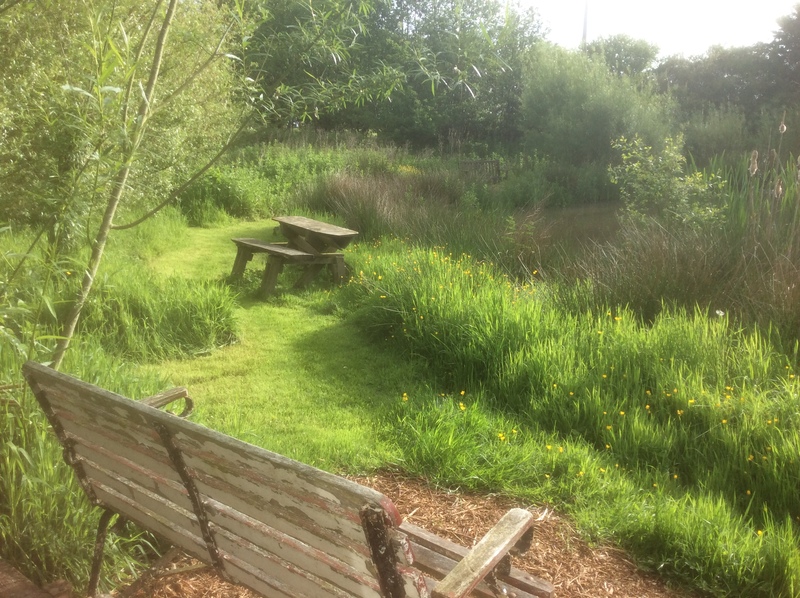 It is located in its own private setting by a wild life pond, there will be a chimenea, (must order one) picnic table and a BBQ… or will it be a pitza oven? This spacious unique and quirky Tent is available for a minimum of two nights. There is a double bed In a furnished room.. Check in between 2pm and 7pm. Your own shower and toilet nearby. You may book this unique and quirky tent from £50 a night for two people. Minimum stay for two nights. It is spacious and offers a fabulous glamping experience, with a private horsebox kitchen to cook and dine in. Outside you can light a campfire or have a bbq. Your own private shower and loo (newly built)is conveniently situated nearby around the back of the tent. 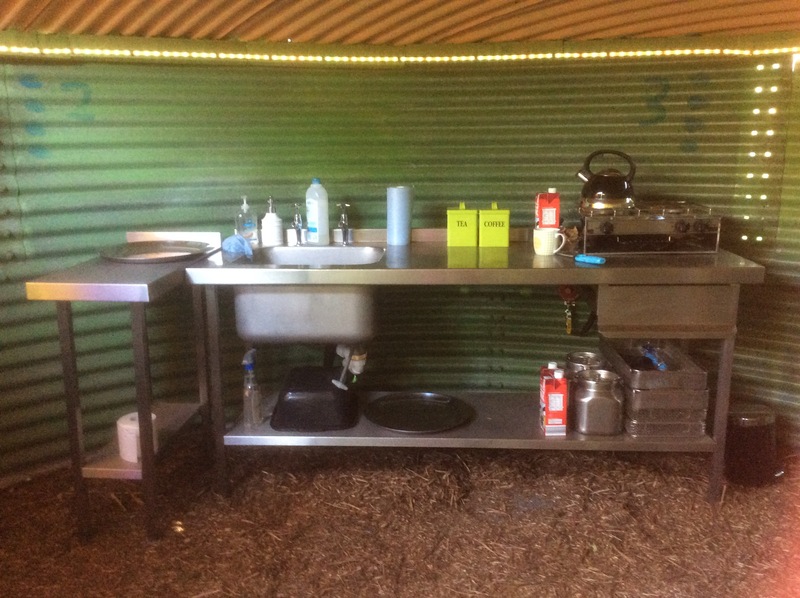 Your kitchen in built inside a small horse box. There is a two ring burner and a kitchen sink. Space for you to prepare meals and eat inside should it rain. The HOOPLA tent sleeps two, it has a double bed and side tables with reading lamps. There is a small sofa and we have added a huge leather chair for you to curl up in! Close by is the outdoor space where you have privacy to enjoy some time to chill out. Here you can swing on the double swing seat , enjoy morning coffee on the raised decking or prepare a meal in the quirky horse box retro kitchen. In the evening you can build a campfire, create a romantic atmosphere with flickering tea lights and drink a glass of wine. Enjoy the peace and quiet and watch out for shooting stars! You may wander around the numerous woodland pathways and sit by a secluded pond. The wildlife here is abundant. Hear owls hoot and wake to a dawn chorus. You may spot a tiny blue or red damselfly or the larger beautiful green dragonfly. Guests often use our binoculars to spot bird life. Buzzards fly overhead, green finches, the robin and the wren are just a few regulars. The first of our fairground hook-a-duck stalls arrived in the autumn of 2017. Without instructions on how to put it together! The problem solving process took all afternoon. Bought in October. It was then dismantled and put away until next season. It is now the beginning of May 2018 and the Hoopla Tent is almost ready for guests. The canvas sides of the tent are up and the rubber matting floor is down. All ready for lighting , carpets and furniture. Outside is warming up ,Spring has sprung and the leaves and blossom is appearing on the trees. Each area is becoming more shaded and secluded each week. Soooo watch this space for more photos, our first guests to experience The Hook a Duck tent arrive soon.